The play may be a little shorter, but the cuts are mere polishing rather than surgery and the result is an improvement. Audience attention-spans will never waver and the play’s progress has an enhanced pace. This may not be ‘Shaw 101’… but it’s certainly not Coles Notes™ either. Panych gets the message across but still manages to entertain his audience. The plot, for those who may not have studied it in High School literature, is about the late 19th century war between the Serbs and their adversaries – Bulgaria. History buffs will recall the gargantuan philosophical dichotomy of Disraeli & Gladstone that repeated itself with Churchill & Chamberlain a half-century later. The sidebar plot: – an evacuee soldier hides out in a girl’s bedroom in order to escape his military opponents. Both are attractive and nature takes effect. Unfortunately, she’s betrothed to a major in her own country’s military. Two suitors: -; two attitudes toward warfare and two opposing forces. Add in some household staff with their own agendas and hope for a Stratford-ian ‘All’s Well that ends Well’. There are some outstanding performances. The young Raina is plausibly portrayed by Kate Besworth in a firm yet ingenuous combination. Suitor one, Maj. Sergius Saranoff is magnificently pompous in Martin Happer’s reading and will evoke a familiar recollection with most audiences. The invasive foreigner (Bluntschli- a Swiss soldier-of-fortune) is played by a resolute but self-effacing Graeme Somerville who we actually begin to hope will win the girl. Laurie Paton & Norman Browning are Raina’s parents and they too, are contrasting opposites. Paton can do more with just a facial aside than many thespians with a ton of verbiage. 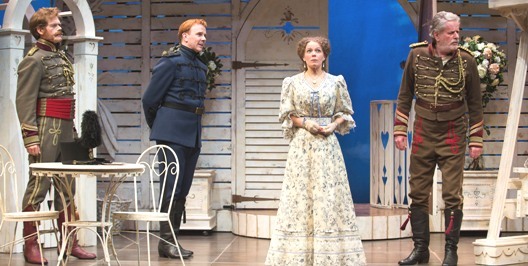 The household help is represented by Peter Krantz who has the best philosophical lines, and Claire Jullien who steals the play in every one of her scenes. We know she’s going to cause trouble! The play runs under two hours, the set is sparse but interesting; the costumes work and the lighting/sound very effective. Do visit the Petroffs either at the St. George Theatre (until Oct. 18th), or the next time you’re in Dragoman, Bulgaria.